We are excited to show you what we have learned in school. Hope you are able to attend our second Presentation of Learning!!!! It will be exciting! K-1 is collecting empty Campbell Soup cans (10-1/2 or 11-1/2 ounce size) for our Christmas project. We have a need for at least 6 more soup cans. Mahalo. Friday, November 9th - Living Art Marine Center Field Trip. Attire - HMS t-shirt, shorts or pants, and athletic shoes with socks. Monday, November 12th - Veterans Day, No School. Tuesday through Thursday, November 13-15 - Donation of canned goods. Thursday, November 15th - RSVP for Presentation of Learning. Friday, November 16th - Parent-Teacher Conferences. Emails were sent out a few weeks ago regarding your scheduled conference time. 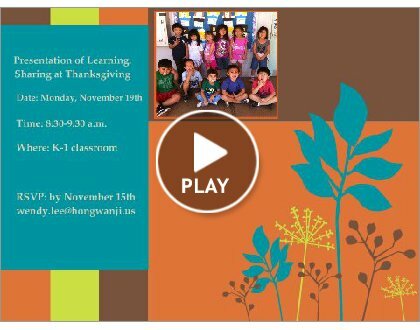 Monday, November 19th - Presentation of Learning in K-1. Wednesday, November 28th - November Book Share due.